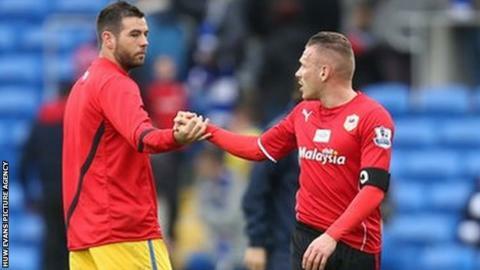 Crystal Palace's Welsh boss Tony Pulis has praised Joe Ledley for his role in the Eagles' 3-0 win against Cardiff. The Welsh international and former Bluebirds' midfielder scored Palace's second goal and set up the first of Jason Puncheon's two goals. Ledley, signed in January from Celtic, received a warm welcome from the Cardiff fans and refused to celebrate his goal. "I thought Ledley was fantastic," said Pulis. Ledley made 258 appearances for the Bluebirds, scoring 31 goals, between 2004 and 2010. He also helped the Welsh club reach the 2008 FA Cup final. "He's brought a little bit of class. He's got a fantastic attitude. "His work rate suits what I want as a manager. His ability is absolutely first class." Before the match against Cardiff both Pulis and Ledley had said they wanted both clubs to avoid relegation from the Premier League. The Welsh international played a pivotal role ensuring his hometown club now need a miracle according to manager Ole Gunnar Solskjaer to stay up. Pulis said the Welshman's passing game was impressive during the victory which moves Palace up to 14th, seven points clear of the bottom three. "The first pass. He passed it through the eye of a needle for Punch [Puncheon] to get hold of it and ... score," said Pulis. Ledley's warm reception from the Cardiff fans at the start of the match was well deserved, said Pulis. "He was a great player and great servant for this football club [Cardiff]," he said. "He's a Cardiff boy. So it's nice."